Since 1960, more than 187,000 people have served as Peace Corps volunteers in 139 countries. The Peace Corps works in over 70 countries around the world. Peace Corps volunteers work with governments, schools, non-profit organizations, non-government organizations, and entrepreneurs in the areas of education, health, HIV/AIDS, business, information technology, agriculture, and the environment. The Peace Corps works by first announcing its availability to foreign governments. These governments determine areas in which the organization can be involved. The organization then matches the requested assignments to its pool of applicants and sends those volunteers with the appropriate skills to the countries that first made the requests. John F. Kennedy greets volunteers on August 28, 1961. Following the end of the Second World War, various members of the United States Congress proposed bills to establish volunteer organizations in Developing Countries. In 1952 Senator Brien McMahon (D-Connecticut) proposed an "army" of young Americans to act as "missionaries of democracy." Privately funded nonreligious organizations began sending volunteers overseas during the 1950s. Only in 1959, however, did the proposal for a national program of service abroad first receive serious attention in Washington when Congressman Henry S. Reuss of Wisconsin advanced the ideas of a “Point Four Youth Corps.” In 1960, he and Senator Richard L. Neuberger of Oregon introduced identical measures calling for a nongovernmental study of the “advisability and practicability” of such a venture. Both the House Foreign Affairs Committee and the Senate Foreign Relations Committee endorsed the idea of a study, the latter writing the Reuss proposal into the Mutual Security legislation then pending before it. 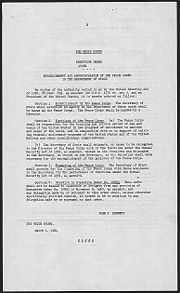 In this form it became law in June 1960. In August the Mutual Security Appropriations Act was enacted, making available $10,000 for the study, and in November ICA contracted with the Maurice Albertson, Andrew E. Rice, and Pauline E. Burkey of Colorado State University Research Foundation to make the study. John F. Kennedy first announced his own idea for such an organization during the 1960 presidential campaign at a late-night speech at the University of Michigan in Ann Arbor on October 14. During a later speech in San Francisco, California on November 1, he dubbed this proposed organization the "Peace Corps." Critics of the program (including Kennedy's opponent, Richard M. Nixon) claimed the program would be nothing but a haven for draft dodgers. Others doubted whether college-age volunteers had the necessary skills. The idea was popular among college students, however, and Kennedy continued to pursue it, asking respected academics such as Max Millikan and Chester Bowles to help him outline the organization and its goals. During his inaugural address, Kennedy again promised to create the program: "And so, my fellow Americans: ask not what your country can do for you—ask what you can do for your country." On March 4, Kennedy appointed his brother-in-law Sargent Shriver to be the program's first director. Shriver was tasked with fleshing out the organization, which he did with the help of Warren W. Wiggins and others. Shriver and his think tank outlined the three major goals of the Peace Corps and decided the number of volunteers they needed to recruit. The program began recruiting volunteers the following July. Until about 1967, applicants to the Peace Corps had to pass a placement test that tested "general aptitude" (knowledge of various skills needed for Peace Corps assignments) and language aptitude. After an address from Kennedy, who was introduced by Rev. Russell Fuller of Memorial Christian Church, Disciples of Christ, on August 28, 1961, the first group of volunteers left for Ghana and Tanzania. The program was formally authorized by Congress on September 22, 1961, and within two years over 7,300 Peace Corps volunteers were serving in 44 countries. This number would jump to 15,000 in June of 1966, the largest number in the organization's history. The organization experienced major controversy in its first year of operation. On October 13, 1961, a postcard was written by a volunteer named Margery Jane Michelmore in Nigeria to a friend in the U.S. She described her situation in Nigeria as "squalor and [of] absolutely primitive living conditions." However, this postcard never made it out of the country. The Ibadan University College Students Union demanded deportation and accused the volunteers of being "America's international spies" and the project as "a scheme designed to foster neocolonialism." Soon the international press picked up the story and this led several people in the U.S. administration to question the future of the program as a whole. Nigerian students protested the program, and the American volunteers sequestered themselves and eventually began a hunger strike. After several days, the Nigerian students agreed to open a dialogue with the Americans. The effect of the Peace Corps at this time was minimal. By 1966, more than 15,000 volunteers were working in the field, the largest number in the Peace Corps' history. In July 1971, President Richard Nixon, an opponent of the program, brought the Peace Corps under the umbrella agency ACTION. President Jimmy Carter, an advocate of the program, said that his mother, who had served as a nurse in the program, had "one of the most glorious experiences of her life" in the Peace Corps. In 1979, he declared it fully autonomous in an executive order. This independent status would be further secured when Congress passed legislation in 1981 to make the organization an independent federal agency. Trainees swear in as volunteers in Mauritania in September 2007. At this time, the Peace Corps began branching out past its traditional concerns of education- and agriculture-related projects. In 1982, President Reagan appointee director Loret Miller Ruppe initiated several new business-related programs. For the first time, a large number of conservative and Republican volunteers joined the contingent of overseas volunteers, and the organization continued to reflect the evolving political and social conditions in the United States. Funding cuts during the early 1980s dropped the number of volunteers to 5,380, its lowest level since the organization's early years. Funding began to increase in 1985, and Congress passed an initiative to raise the number of volunteers to 10,000 by 1992. After the September 11, 2001, attacks alerted the nation to growing anti-U.S. sentiment in the Middle East, President George W. Bush pledged to double the size of the organization within five years as a part of the War on Terrorism. For the 2004 fiscal year, Congress passed a budget of $325 million, $30 million above that of 2003 but $30 million below the President's request. The Peace Corps intended to double the number of volunteers it sent abroad by 2007 in accordance with President Bush's request in 2002. According to Joseph Kennedy, "The American reputation has taken a hit in the last couple of years. The need for the Peace Corps couldn't be more urgent. The Peace Corps shows what is best in America, the generosity of spirit." The Peace Corps is trying to get more diverse volunteers of different ages. This is important so that the Peace Corps can look, according to former director Gaddi Vasquez, "more like America." An article published by the Harvard International Review in 2006 argues that the time has come not only to expand the Peace Corps but also to revisit its mission and equip it with new technology to transform it into a twenty-first-century engine for peace through the global sharing of knowledge. In 1961 only one percent of volunteers were over 50, compared with six percent today. Peace Corps spokesperson Gretchen Learman states, "Age is no barrier to joining the Peace Corps. In many cases, it's an asset, since senior volunteers bring so much knowledge to their work." Married couples are welcome and can work together. Peace Corps Response, formerly named the Crisis Corps, was created by Peace Corps Director Mark Gearan in 1996. On November 19, 2007 Peace Corps Director Ronald Tschetter announced that Crisis Corps will be changing its name to Peace Corps Response. This change is the result of an ongoing effort by the Peace Corps to better define the work of its volunteers. The change to Peace Corps Response will allow Peace Corps to broaden their approach to their five programming areas to include projects that do not necessarily rise to the level of a "crisis." The program sends former Peace Corps volunteers to foreign countries to take on short-term, high-impact assignments that typically range from three to six months in duration. Peace Corps Response volunteers generally receive the same allowances and benefits as their Peace Corps counterparts, including round-trip transportation, living and readjustment allowances, and medical care. Minimum qualifications for Crisis Corps volunteers include completion of at least one year of Peace Corps service, excluding training, in addition to medical and legal clearances. The Crisis Corps title will be retained as a unique branch within Peace Corps Response, designed for volunteers who are deployed to true “crisis” situations, such as disaster relief following hurricanes, earthquakes, floods, volcanic eruptions and other catastrophes. 1 R. Sargent Shriver 1961–1966 Kennedy Three days after President Kennedy signed an Executive Order establishing the Peace Corps, Shriver became its first director. Deployment was rapid: volunteers arrived in five countries during 1961. In just under six years, Shriver developed programs in 55 countries with more than 14,500 volunteers. 2 Jack Vaughn 1966–1969 Johnson Vaughn took steps to improve Peace Corps marketing, programming, and volunteer support as large numbers of former volunteers joined the Peace Corps staff. He also promoted volunteer assignments in conservation, natural resource management, and community development. 3 Joseph Blatchford 1969–1971 Nixon Blatchford served as head of the new ACTION agency, which encompassed U.S. domestic and foreign volunteer service programs including the Peace Corps. He created the Office of Returned Volunteers to help volunteers serve in their communities at home, and initiated New Directions, a program emphasizing volunteer skills. 4 Kevin O'Donnell 1971–1972 Nixon O'Donnell's appointment was the first for a former Peace Corps country director (Korea, 1966–70). He worked tirelessly to save the Peace Corps from budget cuts, and believed strongly in a non-career Peace Corps. He resigned as director six years after first joining the Peace Corps. 5 Donald Hess 1972–1973 Nixon Hess initiated training of volunteers in the host country where they would eventually serve. With this came the greater utilization of host country nationals in the training programs. The training provided more realistic preparation, and costs dropped for the agency. Hess also sought to end the down-sizing of the Peace Corps. 6 Nicholas Craw 1973–1974 Nixon Craw sought to increase the number of volunteers in the field and to stabilize the agency's future. He introduced a goal-setting measurement plan, the Country Management Plan, which gave a firm foundation for increased congressional support and for improved resource allocation across Peace Corps' 69 countries. 7 John Dellenback 1975–1977 Ford Dellenback worked to make the best possible health care available to volunteers. He also placed great emphasis on recruiting generalists. He believed in taking committed applicants without specific development skills and providing concentrated training to prepare them for service. 8 Carolyn R. Payton 1977–1978 Carter Payton was the first female director and the first African American. As director, she believed strongly in reflecting America's diversity in the corps of volunteers and worked tirelessly to convince young people that Peace Corps service would enrich their lives. 9 Richard F. Celeste 1979–1981 Carter Celeste focused on the role of women in development and was successful in involving women and minorities in the agency, particularly for staff positions. He invested heavily in training, including the development of a worldwide core curriculum, so that all volunteers had a common context in which to work. 10 Loret Miller Ruppe 1981–1989 Reagan Ruppe was the longest-serving director and a champion of women in development. She launched the Competitive Enterprise Development program to promote business-oriented projects. She also established the Caribbean Basin Initiative, the Initiative for Central America and the African Food Systems Initiative to help address regional challenges. Ruppe was highly regarded by volunteers for her tireless energy and enthusiasm. 11 Paul Coverdell 1989–1991 G.H.W. Bush Coverdell established two programs with a domestic focus. World Wise Schools enabled U.S. students to correspond with volunteers serving overseas in an effort to promote international awareness and cross-cultural understanding. Fellows/USA assisted Returned Peace Corps volunteers in pursuing graduate studies while serving local communities in the U.S.
12 Elaine Chao 1991–1992 G.H.W. Bush Chao was the first Asian American to serve as director. She expanded Peace Corps' presence in Eastern Europe and Central Asia by establishing the first Peace Corps programs in Latvia, Lithuania, Estonia, and other newly independent countries. 13 Carol Bellamy 1993–1995 Clinton Bellamy was the first RPCV (Returned Peace Corps volunteer) (Guatemala 1963–65) to be director. She reinvigorated relations with Returned Peace Corps volunteers and launched the first Peace Corps web site. 14 Mark D. Gearan 1995–1999 Clinton Gearan established the Crisis Corps, a program that allows Returned peace Corps volunteers to help overseas communities recover from natural disasters and humanitarian crises. He supported expanding the corps of volunteers and opened new volunteer programs in South Africa, Jordan, Bangladesh and Mozambique. 15 Mark L. Schneider 1999–2001 Clinton Schneider was the second RPCV (El Salvador, 1966–68) to head the agency. He launched an initiative to increase volunteers' participation in helping prevent the spread of HIV/AIDS in Africa, and also sought volunteers to work on information technology projects to enhance development of overseas communities. 16 Gaddi Vasquez 2002–2006 G.W. Bush Gaddi H. Vasquez was the first Hispanic American to serve as director. His focus as director was to revitalize the Peace Corps through a comprehensive outreach and recruitment program focused on attracting a diverse group of volunteers and staff. 17 Ron Tschetter September 2006 - present G.W. Bush The third RPCV to head the agency, Tschetter served in India in the mid 1960's. Confirmed by the Senate September 13, 2006 and sworn in on September 26, 2006. Published in 1969, Moritz Thomsen's Living Poor recounts the author's service as a Peace Corps volunteer in Ecuador. RPCV Paul Theroux said that Living Poor was the best book he ever read on the Peace Corps experience and Tom Miller wrote that Thomsen was "one of the great American expatriate writers of the 20th century." "And as an expat, he was free to judge us all, an undertaking he finessed with acute observations, self-deprecation, and a flavorful frame of reference that ranged from a Tchaikovsky symphony to a Sealy Posturpedic mattress." Alan Weiss's 1968 account of Peace Corps training, High Risk, High Gain, has been called "perhaps the most obscure, least known, and most unread" of all the great books written about the Peace Corps experience. Trainees in those days were classified by risk and by gain and Weiss discovered in his training days that he had been classified as High Risk/High Gain, a potential "Supervolunteer" or a potential "crash and burn." Weiss's book is funny, outrageous and sad but also valuable because it captures the “craziness” of those early years at the Peace Corps. George Packer's The Village of Waiting (1988) is "one of the most wrenchingly honest books ever written by a white person about Africa, a bracing antidote to romantic authenticity myths and exotic horror stories alike," wrote Matt Steinglass. Isak Dinesen, Packer notes, wrote of waking in the Kenyan highlands and thinking, "Here I am, where I ought to be." Packer himself woke up sweating, hungry, "mildly at ease, or mildly anxious. But never where I ought to be." Jimi Sir, released in 2007, is a documentary portrait of Peace Corps volunteer James Parks' experiences as a high school science, math and English teacher during the last 10 weeks of his service in Nepal. James speaks Nepali fluently and brings you into a culture where there are no roads, vehicles, electricity, plumbing, telephone or radio. Jimi Sir has been called the best movie ever made about the Peace Corps experience. All links Retrieved May 24, 2008. ↑ Congressman Crenshaw Honors Local Peace Corps volunteers|accessdate 2005-05-11 2007 United States Congressman Ander Crenshaw. ↑ Jeff Wilson, 2006. Peace Corps: A Change of Mind and Heart accessdate 2007-05-12 Whitworth College. ↑ New Frontiers for American Youth: Perspective on the Peace Corps. Public Affairs Press, 1961. ↑ Inaugural Address of John F. Kennedy. accessdate 2007-05-11 The Avalon Project 1997. The Avalon Project at Yale Law School. ↑ Peace Corps Writers. "915 Peace Corps volunteer writers by country". ↑ 18.0 18.1 18.2 Tucson Weekly. "Under the Skin of a Locale". by Tom Miller. June 16, 2005. ↑ International Traveler. "The Farm on the River of Emeralds" by Moritz Thomsen reviewed by Brad Newsham. ↑ 20.0 20.1 20.2 Peace Corps Writers. "High Risk/High Gain: A Freewheeling Account of Peace Corps Training" by Alan Weiss. Reviewed by John Coyne. May 11, 2005. ↑ 21.0 21.1 Salon. "Destination: Togo" by Matt Steinglass. ↑ Amazon. "Come As You Are: The Peace Corps Story" by Coates Redmond. ↑ Random House. "A Conversation with Tom Bissell". Retrieved June 1, 2008. ↑ "Jimi Sir an American Peace Corps volunteer in Nepal" December 18, 2004. ↑ Fallen Peace Corps Volunteers. Jesse Thyne.. Retrieved June 1, 2008. ↑ "Death of two sons." . NICOLE BODE, New York Daily News. Peacecorpsonline. Retrieved June 1, 2008. "A Bibliography of Writings by Returned Peace Corps volunteers by Countries of Service" Peace Corps Writers. Retrieved May 24, 2008. The Peace Gallery Over 700 photos by Peace Corps volunteers around the world. This page was last modified on 31 January 2019, at 17:29.